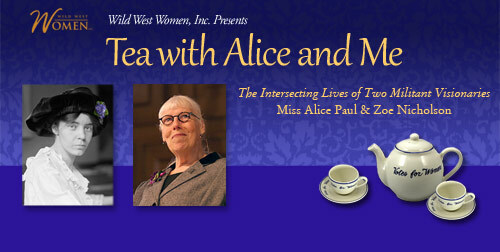 Tea With Alice and Me to Premiere January 7, 2018 – Wild West Women, Inc. TEA WITH ALICE AND ME premieres on Sunday, January 7, 2018, 2 pm in the West Hollywood City Council Chambers, 625 N. San Vicente, West Hollywood, CA 90069. Begin the New Year with the experiences of one who was un-daunted by challenges and defeats–to winning Women suffrage, 1920, and beyond. Suffragist ALICE PAUL was the first to bring non-violent, direct action to America, 10 years before Gandhi and MLK; leader of the activist branch of women’s suffrage movement, a picket who was forced fed, to win the vote in 1920. Author of the Era, and worker for Women’s Rights until her death at age 92! Her tactics, philosophy and experiences give us tools today for our own activism, righteous indignation, and passion to build a torch, light it, and carry it for Equality. *The performance includes a Q and A and a tea reception. *Parking is free with validation at the site.